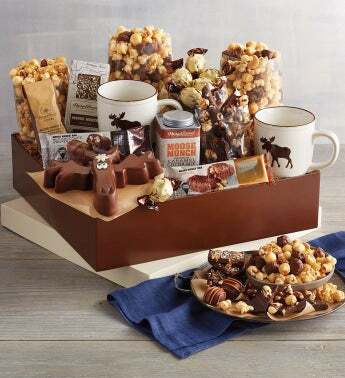 Explore the wide world of Moose Munch® Premium Popcorn with this assortment of goodies inspired by everybody's favorite snack. Among the deliciousness are favorites like irresistible Moose Munch® Bars and bold Moose Munch® Coffee, plus new treats like a playful milk chocolate moose. Of course, it's all topped off with three classic flavors of crunchy, nutty, Moose Munch® Premium Popcorn.